Posted on December 25, 2017 - By Fucosoft | Follow YouTube, Twitter to Get More Information. For recovering deleted files from your Android device with any Android Recovery software, or accessing the files stored on your Android phone from computer, you should first connect Android to PC either with a USB cable or through Bluetooth or Wi-Fi. Here this guide explains how to enable USB debugging and connect Android to PC over USB. Before connecting your Android phone to PC, please make sure you have enabled USB debugging on the device. If you don’t know how to do this, please first refer to Part 2. Plug your Android device into computer using a USB cable. When successfully connected, a USB icon will appear in your PC’s status bar. On your Android pone screen, pull down the notification bar and tap on “USB connected”. Tap “Connect USB Storage” then “OK”, your Android phone will appear as USB disk driver under “Devices with Removable Storage”. To successfully connect Android phone to PC, the USB debugging is always the first operation required. If you have no idea about it, the steps below outline how to enable USB debugging on different versions of Android. For Android 4.2 or newer: Go to Settings > About phone > Hit Build number for 7 times until get a message “You are now a developer!” > Back to Settings > Developer options > USB debugging > Tap OK.
For Android 3.0 to 4.1: Go to Settings > Developer Options > USB debugging > Tap OK.
For Android 2.3 or earlier: Go to Settings > Applications > Development > USB debugging. Note: You can follow these steps to enable USB debugging on Android phones like Samsung Galaxy S9/Note 9, HTC U12+, Huawei Mate 20 Pro, Google Pixel 3 XL, LG G7, OnePlus 6T, Sony, Moto, Xiaomi, Oppo, etc. It is quite simple to enable USB debugging on Android phone with good screen. What if the Android phone screen is broken? How to enable USB debugging on Android with broken/black screen? Don’t worry. Here’s your solution. Step 1. Buy an OTG Adapter and make sure your Android phone is compatible with it. Step 2. 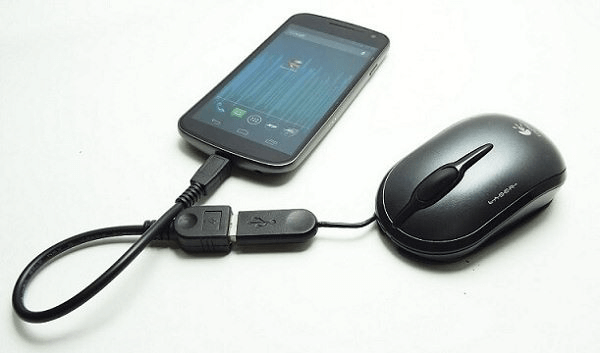 Use the OTG Adapter to connect your broken Android phone with a mouse. Step 3. Click the mouse to unlock your Android phone and turn on USB debugging on Settings. Note: This is workable when your Android display is still on. Or you can try to enable USB debugging from computer using fastboot, ADB command or terminal. But we don’t suggest you do these if you don’t have advanced computer knowledge, as a simple mistake could damage your phone permanently. We already explained how to connect Android to PC as well as enable USB debugging on both good and broken screen. If your Android phone still won’t show up on your computer, you should try the following tips. Check whether the USB cable and USB port is in good condition or not. Try another USB cable or another USB port on your computer. Check if you have install the proper USB driver for your Android device. Try to reinstall the old UBS driver and install the latest one from its official site. Restart both devices if your Android phone is not showing up on your PC.